Skane = Professional Communication, great customer service! Skane made my transaction with him super smooth! Great communication, professional in every way, and the katana arrived superbly packed! Looking forward to what he sells next - I thoroughly enjoyed doing business with him. I highly recommend skane! 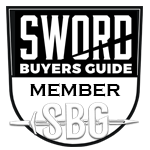 Thank you for the smooth transaction Rolando, enjoy the sword!